I’m often asked if I know of any muffler men for sale. Although there are over 180 muffler men out there they are rare and hard to find if your interested in getting your own. Owners are generally very reluctant to part with their giants. Another common question is “what is a muffler man worth?” This can vary greatly, I have heard of muffler men selling for as little as $30 and for well over $20,000. There is no official price for the giants since the originals sold for much less back in the 1960’s. If your interested in purchasing a Muffler Man be sure and check this page a few times a month as I update it when I hear of a Muffler Man for sale. If you have a Muffler Man and want to sell him, this is a great place to advertise. If you are interested please send an email to info@usagiants.com with the muffler man info and pictures and we will contact you with further details. Your also welcome to comment below. Also be sure and check out our restorations page. We have the ability to make spare parts for Muffler Men and those are available by order. We also specialize in complete restorations. This original International Fiberglass American Indian Chief is up for sale and his owner is accepting offers on him. He is currently being stored on private property and is not visible to the public. His owner told me that he obtained him long ago from North of Boston. It is very likely this could be the long lost Indian that stood at Sea Crest GM in Lynn Mass along with a few other Muffler Men they had on the lot. He currently needs a a restoration and we are happy to point you in the right direction for that and help you get the missing arms for this guy made. If your interested please contact the owner for more details. This head once belonged to a standard Muffler Man or Cowboy in Southern California. He was picked up in the 80s by an artist who lived in San Diego and built this base for him and was sold a number of years ago with that artists estate when he passed. His new owner brought him to burning man this year, where his picture caught my attention of American Giants. He is currently in a private collection until we find a good place to display him where the public can enjoy him and his history appreciated. The Cowboy in Billings, MT originaly stood at a Phillips 66 station in Milford, NE at the giant covered wagon. It was moved in the 90s to Cody, WY where it stood for a few years before being relocated to Billings MT by a Muffler Man collector. It was recently sold in early September and moved to Pomeroy, WA. The Native American Brave in Asheville has been standing at Harry’s On the Hill since the late 60s when he was used to advertise for Pontiac. The dealership recently decided to take him down due to changing times and culture and because they no longer sell Pontiac cars. We helped with taking him down and transporting him to restoration. He will be restored and set up at a Pontiac Museum in Pontiac, MI sometime late this year or early 2019. This Indian was once one of 3 chiefs that stood in Buffalo, NY. In the early 80s the giant was moved to Perry, NY and stood on a rural road and had his arm stolen. In the mid 90s he was moved to Arcadia, FL and stood at a campground until a hurricane took him down in 2005. He has been laying in some swampy woods for years and we were able to rescue him in June this year for a full restoration, he is currently being restored by Bruce Kennedy in Hayward, CA. We sold our Winter Garden Unrioyal Gal to a collector in Dallas, GA in Mary of 2018. She once stood at Griffith tire and then was sold to a boat business in the early 90s. She stood on Florida Highway 50 until the business closed in 2001. American Giants has been looking for her on an off since 2012 and finally located her late last year and negotiated a sale. We spent 10 months on her restoration and her new owner wanted her to look like wonder woman so we gave her that paint job which is perfect because when new in the mid 60s she was called Miss America in the International Fiberglass catalog. In 2017 Bruce Kennedy of Bell Platics in Hayward, CA made a mold of the former Mt Vernon Uniroyal Gal. He used that mold to make a new Uniroyal Gal for famous Chef STRETCH who purchased her and hauled her to Lawrence, KS in early 2018. She now stands inside his restaurant called Grinders LFK and looks just like an original. Grinders has been on the food channel and is famous for it’s pizza and philly cheese steak. It’s to often that you get to see these giants indoors or holding a giant martini glass. Delivered to Maine in the 1960s this unique bow tie version stood in Oakland until he was purchased by Micky Marden for Marden’s Salvage and Surplus. He was used in the 80s and 90s and finally put into storage. He was rediscoved during cleaning in 2016 and auctioned here on this page on December 10. He will get some restoration at our shop in IL before being delivered to his new owners in Richardson, TX in 2018. Once standing in Calgary Alberta at a Phillips 66 gas station this long lost Muffler Man was discovered in the fall of 2017 by a youtuber in a junk yard. American Giants became aware of him and negotiated the sale and picked him up in November. He was transported to Denver before moving on to Mark Cline in Virginia for a full restoration during the winter and spring of 2018. An original 1963 14ft version Muffler Man was sold at EJ’s auction for $800 in late September. He came from the Minder Binder Bar in Tempe and used to hang from the ceiling above the stage. He was in rough condition with a missing head and arms and a replacement bear head (also original IF) Not sure yet who bought him or where he is going. An original Bunyan head that at one time was part of a 20ft version Muffler Man was sold at EJ’s auction for $1,100 in late September. He came from the Minder Binder Bar in Tempe and used to hang on the wall along with many other unique items. He was in rough condition with a poor paint job and some cracking. Not sure yet who bought him or where he is going. International Fiberglass made a non little known giant for the short lived Wagon Ho fast food chain. These seated teamasters perched on top of the resturants, made to look like covered wagons. Although an impressive site the chain died quickly and the giants found various new homes, mostly in the Carolinas. One such giant originally sat in Eastwood Mall in Birmingham, AL but retired to the countryside years later. He has recently been sold and will be moving west! More details soon. The Mecca CA Muffler Man has been in California probably since he was a Phillips 66 Cowboy. He ended up alongside 111 in Mecca near the Salton Sea at a small convenience store, In 2001 his head vanished and finally he disappeared entirely in 2007. In 2014 he reappeared at the same location full restored and with his head again. In mid May 2017 he was sold at the Yucca Valley swap meet and it is unknown where he will end up. The Winter Garden Uniroyal Gal has been in Florida since she advertised for Uniroyal back in the 60s. She ended up at Griffith tire and then was sold to a boat business in the early 90s. She stood on Florida Highway 50 until the business closed in 2001. American Giants has been looking for her on an off since 2012 and finally located her late last year and negotiated a sale. At this point we eventually plan to restore her and possibly work with events and venues to display her from time to time. This cowboy Muffler Man stood at the Hurricane Car Wash in Nampa, ID in the late 1990s. In the early 2000s he was moved to Bridger, MT and in 2003 he was set up in front of a casino. He is most likely a former Phillips 66 Cowboy and still has his original platform. In 2016 he was sold to The Museum of Clean in Pocatello, ID and will be transformed into the largest janitor. The museum will keep his hat on display but he will no longer be a cowboy. This cowboy was originally at a business in Belleville, IL and was purchased by Croft Trailer sometime in the late 90s. It was installed on the roof of the business until 2009 when a violent windstorm blew him down. 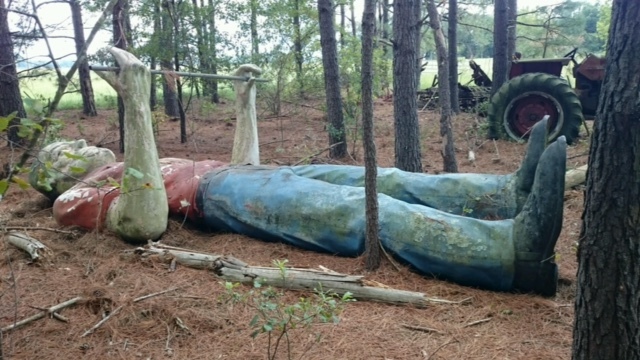 He was badly damaged and laid where he fell until he was purchased by American Giants for restoration in October 2016. He will be fully restored to a Phillips 66 Cowboy. After holding a sucessful auction for a Mr Bendo Muffler Man, American Giants received allot of interest in the second one that was not sold. It needed some repair on the legs and so it was stored until we were able to repair the fiberglass damage. In October we sold the second Mr Bendo that is a twin to the current giant in Indianapolis and the other Bendo in Cleveland MO. The giant was set up in December 2017 in Dallas, GA in an industrial area. American Giants was recently able to purchase the former Texaco Big Friend turned green giant, from the Pahrump Museum. After being decommisioned by Texaco, somehow the Young Electric sign company got him and sold him in 1981 to Jack Stanton who had him turned into the Valley Homes Giant and set up on the sign. He was taken down in 2013 and heavily damaged before being donated to the local Museum. We plan to completely restore the former Big Friend and eventually display him at different locations across America. American Giants recently held it’s first Muffler Man auction and sold a rare Mr Bendo version. The giant was stored at the restoration shop in Southern IL for a few years before being sold to the high bidder “stoneones”on July 17, 2016. In early 2017 the giant was permanently set up at Stones Last Resort in rural Cleveland, MO. It is a camp that can be rented out to groups and the giant stands on a pedestal next to the main building deep on the property. Big George has been a resident of Warrenton, TX since at least 2000 at the Sterling McCall Old Car Museum. Today the business is called the Lone Star Gallery but it is owned by the same family. Big George is a classic service man version and was in great condition when he was first set up. Sadly he toppled over during a storm in 2010 and got busted up pretty good. He has been in storage for the last 5 years and was sold in January 2016 to Vintage Roadside of Portland, OR. A full restoration is in this giants near future. American Giants was happy to be of help to Kevin Cummings, president of Cummings Plumbing Heating and Cooling, by advertising the auction of the Muffler Man in Rapid City South Dakota. He won the auction for the miner/cowboy and waisted no time in moving him to his business in Tucson, AZ. Although the Muffler Man looked almost brand new in the pictures, Kevin told us that he actually needed a full restoration to fix the many cracks and paint job. Kevin displays his cowboy with the University of Arizona logo on his hat, the Muffler Man is Arizonans biggest fan. It has been rumored for awhile now, that the Havre De Grace Muffler Man might be moving. The business has been closed for some time, and a few people have been wondering if the giant would be put up for sale. The giant was spotted on Dec 2 on a trailer being hauled away from the business he has stood at for so many years. It was revealed later that the giant is in storage at the owners residence after the sale of the property and was not sold. 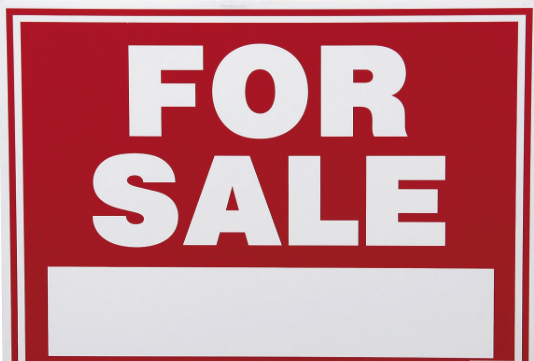 A Muffler Man was recently sold in South Carolina. He was in Savannah back in the 60s and stood at a Muffler Shop. The sellers father purchased the place in 1978 and turned it into a car wash but did not want the giant at the business so he was taken down and hauled up to SC and stored on private property. It is very possible this is an old Phillips 66 Cowboy. I have seen pictures of one in 1966 in Greenwood, SC. The giant was sold in late September and has been moved to Grove, OK.
A few months back I posted a the El Monte Muffler Man in this For Sale section after hearing that he had been advertised on craigslist. The El Monte Muffler Man is one of just a handful of Golfer versions left and used to stand at Three Oaks Golf and Slide in Monrovia back in the mid to late 60s. After the place went under he was moved to El Monte where he stood until August when he was moved all the way to Tennessee! He now stands at Four Way Muffler in Gallatin. 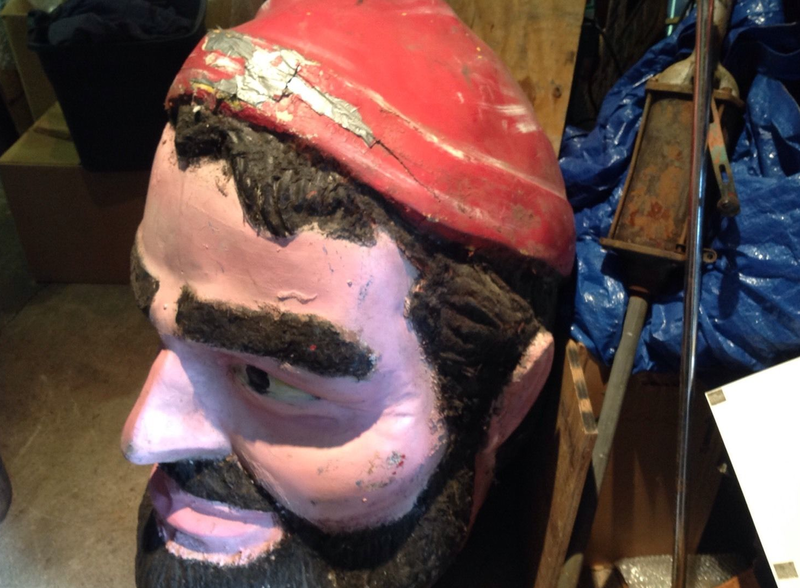 A Muffler Man head recently popped up for sale at a flee market in Brimfield, NJ. I think this may be the Muffler Man that once stood in Manville, RI at a small lumber company. The giant went missing in 1993 and this head very well could be from that giant. It is unknown if the rest of the lumberjack survived but the head was purchased by Vintage Roadside in Oregon. After 64 years of serving the Mt Vernon area, Stan the Tire Man closed it’s doors on the first of June 2015. Stan Koziara opened his tire shop in 1949 and became known as Stan the Tire Man. Sixteen years later he became aware of International Fiberglass and Muffler Men through a colleague at Lauterbach Tire in Springfield IL, who had purchased one of the Bunyan models. Stan ordered a lumberjack and also picked up a Uniroyal Gal, after she was no longer needed by the Uniroyal company. In 1993 Dale Lowery purchased the business and he and his wife took over operations. Both statues stood together for many years at one of the stores until the Bunyan was moved to another location and then sold in 2007. The Uniroyal Gal stood on at the main store until it was announced Stan’s was closing. 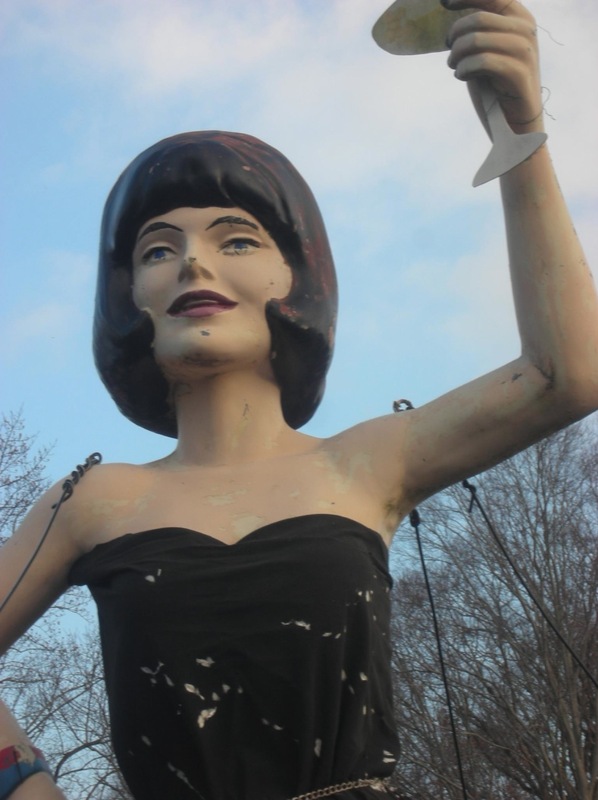 That’s when Bruce Kennedy from Hayward, CA found out about the gal looking for a new home, and decided she would be a perfect addition to his growing collection of International Fiberglass giants. It isn’t very often a unknown Uniroyal Gal pops up for sale. Surprisingly this one has been for sale since 2013 but was only advertised locally, until her owners found this website. She is originally from Chinqoteague VA and stood at a mini golf course back in the 80s. The golf course when out of business and she was thrown into a swamp. In the 90s some farmers from Kingsville Maryland were trying to get the Viking in town but the owner didn’t want to sell him and told them about the Uniroyal girl in the swamp. They found the owner and purchased her and she has been at Huber’s Farms on their haunted hayride for many years. She was just recently sold and moved to Livingston, IL and will join some other giants at the Pink Elephant Antique store on old Route 66.
there is one going up for auction in springfield mass This coming Friday…The Plantation Man. Thanks so much for letting me know, I’ll do a blog on this and also added the information to my “for sale” section. Shipping weight with box 800 lbs. 1/2 down 1/2 when we ship. Deposit can be credit card. I would like to buy a muffler man or uniroyal gal or any other large fiberglass statue. We have Big Ed for sale! Located in Rapid City, SD see pictures on roadside america Stamper Miner. He will be going up for auction on 5/28 unless he sells before then. . Looking for any large fiberglass statue for my fence shop. WE ARE IN CAMERON,SC AND HAVE ONE FOR SALE THAT WAS IN SAVANNAH, GA UNTIL WE AQUIRED HIM IN 1978…I’LL HAVE TO GET PICTURES AND DIMENSIONS. FOR INFORMATION (this giant has been sold)….PLEASE NO CALLS AFTER 8:00PM.. Condition not important as long as it’s complete. Hello, I do have a Texaco Big Friend head that is for sale. Any photos of the head you have? Does it have the hat? Thanks! How much is the head.? Keep your eyes on this for sale page, I update it whenever I hear about Muffler Men coming up for sale. I’ll let you know if anything pops up, keep checking this page. I am looking for the requirements for erecting a 26 foot muffler man. I need the dimensions for the concrete base and any tips on erecting it and tethering it for wind. Any advice would be greatly appreciated. We just installed big Ed in Tucson call 5203109226 we have a complete concrete base and set of plans we had to have done. Looking for old giants, zoo animals, characters and theme park stuff for filming of project auction reality show filming this year, not another shipping wars. Looking for good condition muffler man in Atlanta Georgia. Have 3 highly visible locations for statues. Would like at least one original if possible. Like to collect old junk, but have interest in making advertising landmark. They have a couple acers of old molds and parts and pieces. the rehab units and make new ones too. 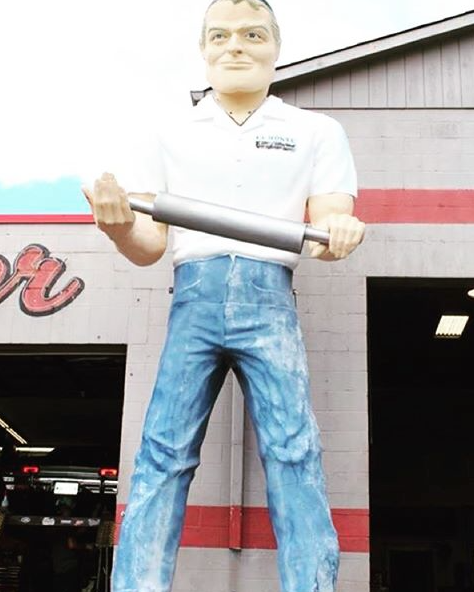 We visited them in Sparta WI a few years back and they had a 60 muffler man that they were repairing and converting into something new for a client. I am interested in purchasing a Muffler Man for my lumber business, if anyone has one they would like to sale please let me know. I live less than a block from the Lauterbach giant. I would like to be in Livingston when she is installed. We would like to purchase one if anyone is selling!! Is the Texaco big friend still for sale if so how much and where are you located? How much is my Mr. Bendo’s brother? Who do I need to contact about buying it? I am very interested in it.. who do I need to contact ? Sent you an email Richard! I would like to buy Texaco big friend or any other large fiberglass statues to add to my collection at the Pink Elephant Antique Mall in Il. I’m looking for a Uniroyal Tire gal. Anyone have one available? Thanks. I have one for sale in Los Angeles. I have one of the giant cowboy hats for sale. Contact me at Robin@rockingrobin.com I’m in CA. Thanks for your comment, we are happy to recognize Glen Goode and his collection of Muffler Men in Gainesville and his enormous contribution to roadside Americana, we visited with him multiple times before he passed. However, the giants were made years before Glen found one and made copies. In fact, the head and bodies Glen stuck together belonged to separate giants originally. His giants still remain in the family but they don’t sell and repair them. Today, restoration on original Muffler Men is mostly done by American Giants or Bell Plastics in California with some Muffler Men owners choosing local fiberglass and auto body shops to do the repairs. Looking for a paul Bunyan statue to put outside my Saw shop do U know anybody that has one for sale?